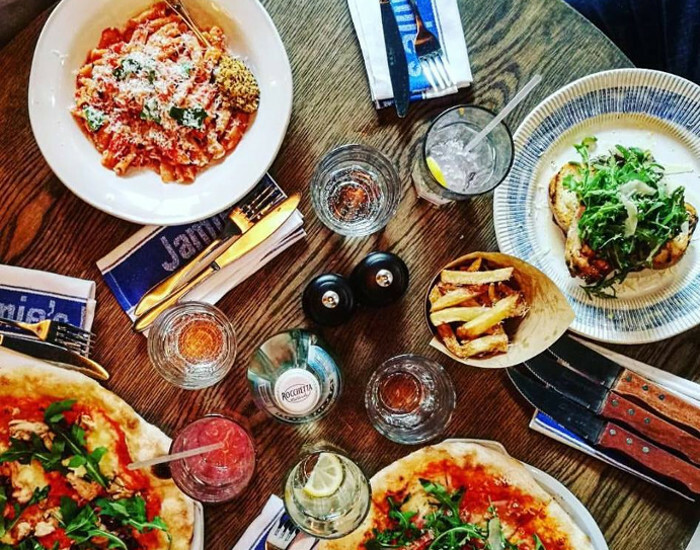 Jamie's Italian at Melrose Arch offers impeccable service and simple, but delicious grub that will keep you coming back for more. Very few restaurants get the whole casual dining thing right. Believe it or not, casual dining doesn’t have to mean cheap and nasty, you still want to tuck into delicious food and enjoy it a great environment. Here in SA, we’ve gotten a little too used to casual dining meaning mediocre service, less-than-great ingredients, and ‘low’ prices. Which is why I was so excited when I heard that Jamie’s Italian was coming to our shores. If ever there was a king of a casual dining, it’s Jamie Oliver — the man does laid-back like no one else can and his unique brand of casual dining with a luxury twist has made the Jamie’s Italian brand a global success. I’d heard mixed reviews about the spot before popping in, and while Jamie’s Italian at Melrose Arch might not be for everyone, the eatery definitely does casual dining the way it should be done – with the very best fresh ingredients, impeccable service, and simple, but delicious grub that will keep you coming back for more. Fans of Jamie Oliver’s uncomplicated, wholesome food will love this eatery at Joburg’s chic Melrose Arch which offers the same classic Jamie’s Italian menu that fans have come to love from the global chain. Looking at the varied menu, with a wide offering of pasta, pizza, salad, grills, and seafood dishes, it’s easy to see why the restaurant has become an instant success in Joburg. While you may think that the novelty of a Jamie Oliver linked restaurant would have worn off by now, hungry customers keep coming back for the deliciously simple food. If you ask me, it’s because the menu and the ingredients used to create each dish are wonderfully accessible. Jamie’s Italian isn’t about stuck up dishes that are too fancy to pronounce or ingredients you’ve never even heard of before, let alone seen in a supermarket. The dishes are easy to recognise and reading the menu it is clear that each dish is infused with Jamie’s signature brand of cooking. And as simple as the ingredients may be, the team behind the SA eatery makes sure that they are all carefully selected and sustainably sourced with a big focus on locally sourced ingredients. 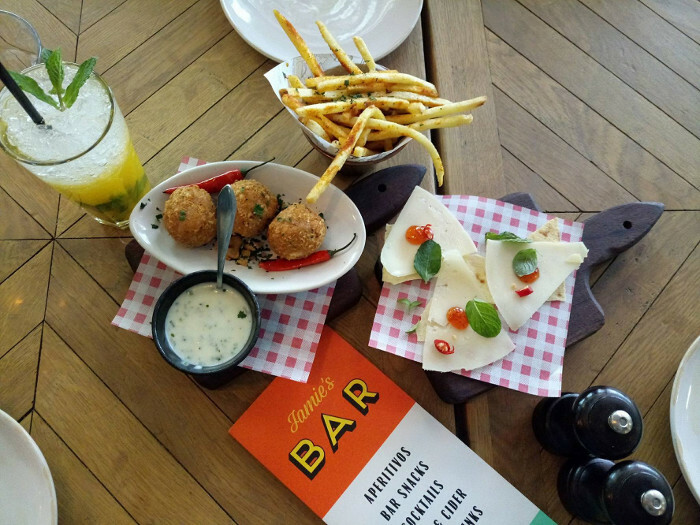 Arancini Margherita, Magic Bread, and Spicy Fries at Jamie’s Italian, Melrose Arch. We started off our meal with a few light starters from the Antipasti menu and after much deliberation decided on the Arancini Margherita (crispy tomato & mozzarella risotto balls with herby fonduta – R55), Crispy Music Bread (served with pecorino and chilli jam – R40), and Spicy Fries (with Gennaro’s chilli rub – R35). 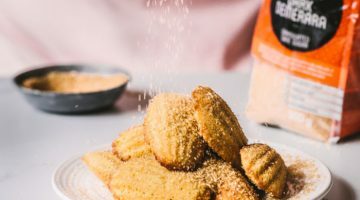 I enjoyed every mouthful of the Arancini balls – the creaminess of the herby fonduta and the crispiness of the Aranci made for a delightful flavour combination that I won’t soon forget. I wasn’t blown away by the Music Bread, and at R40 for three slices, I would have much rather ordered another portion of Arancini to enjoy before my meal. Rather surprisingly, the spicy fries were another winner of note – the chilli rub they sprinkle on the fries is simply divine and will change the way you think about the humble fried potato chip. 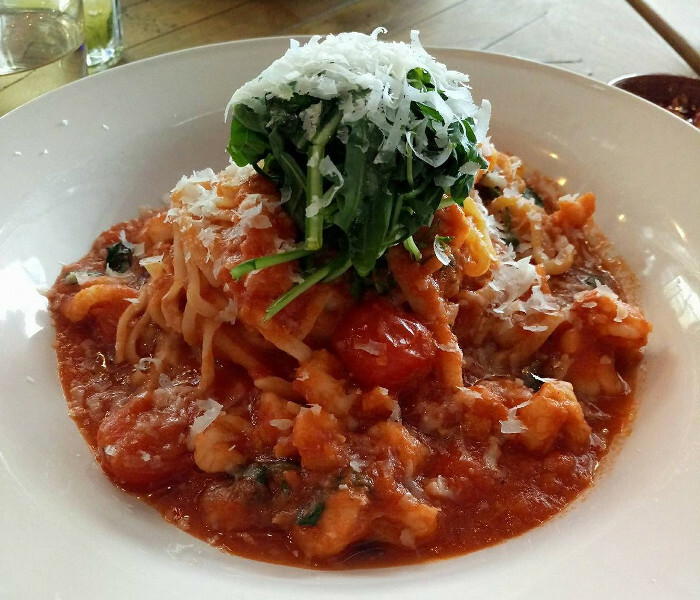 For mains, I ordered the famous Jamie’s Prawn Linguine (garlicky prawns with tomato, fennel, saffron, fresh chilli, and rocket – R205) while my dining buddy had a classic Gennaro’s Tagliatelle Bolognese (grass-fed beef, slow-cooked and topped with Pangrattatto and Parmesan – R115). Jamie’s Prawn Linguine at Jamie’s Italian Melrose Arch. After just one mouthful of the Prawn Linguine, it was easy to see why this dish causes such a stir worldwide. The tomato-based sauce was packed with flavour and offered a beautiful spicy sweetness that perfectly complemented the prawns. The dish didn’t have an overbearing seafood (or fishy) taste and the portion size was beyond generous making it a great choice if you’ve arrived hungry. As for the Tagliatelle Bolognese, this dish was indeed the true hero of the day for me. I’ve yet to eat a more perfect Bolognese here in SA and now, weeks later I am still craving this delightful dish. While many try to make Bolognese an overcomplicated affair, this simple dish allowed the flavour of the slow-cooked beef to shine through and take centre stage. Dessert was a journey all on its own and I made sure to leave space for the famous Epic Chocolate Brownie (with proper chocolate sauce, salted caramel ice cream, and caramelized Amaretti popcorn – R65) which definitely lived up to the hype. The brownie was gooey, chocolately, and had just a little bit of crunch from the caramelized popcorn – basically everything you would expect from an epic brownie. The portion size of this dessert is quite generous so find a buddy and share or you will experience death by chocolate and it won’t be pretty. 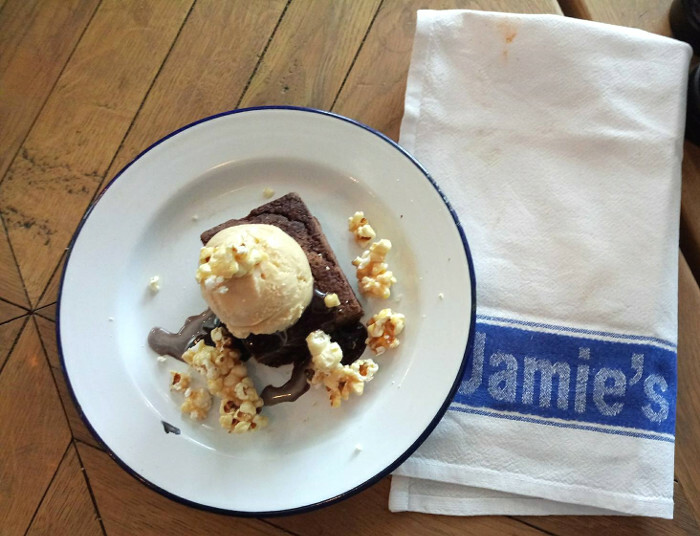 Epic Chocolate Brownie at Jamie’s Italian Melrose Arch. Overall, I was hugely impressed with Jamie’s Italian, while the mains prices might seem a little steep when compared to other casual dining restaurants in SA, the dishes at Jamie’s Italian are indeed worth splashing out for. I haven’t had pasta this good in a while and I would easily pay R115 to enjoy that delightful Bolognese again and again. Yes, we all know that Joburg has some of the best Italian restaurants in the country, but Jamie’s Italian does a great job of holding its own with some of the best the City of Gold has to offer. For more information on Jamie’s Italian South Africa and to book a table visit the Jamie’s Italian website. To keep up to date with more Jamie’s Italian restaurant openings in South Africa say Hi to Jamie’s Italian SA on Facebook.